Being a photographer allows the world to see from your perspective. It’s impossible to know what little things catch your eye, how you interpret beauty, or what you view as worthy to freeze and preserve in a momentary snapshot. Thanks to cameras being just about everywhere through smartphones and digital cameras, we can now shoot and share imagery whenever we want. The big factor with keeping those memories is being able to store their data somewhere. Since we don’t use film anymore, most cameras use an SD card, and if you don’t have one that has 128 gigs, you likely have a fair number of them. To keep them safe regardless of where your travels take you, it might be wise to keep them in something like this Memory Card Case Protector. 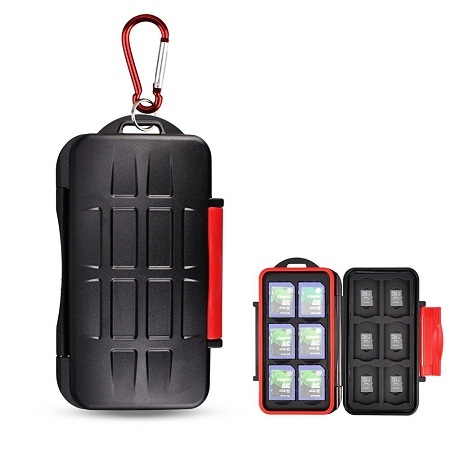 It can hold 12 SD cards, 12 Micro SD cards, is water resistant, and anti-shock. This is a $10 purchase that is likely only going to appeal to avid photographers who have one too many SD cards. The case is air tight with a snap to make sure no dirt, water, or scratches can be found on your cards. There is also a rubber lining to prevent water damage, and a metal carabiner so it can be clipped on your bag, though chances are you’ll want to put it in your bag just in case the carabiner breaks on you.